That is a fact, you remember only the best and the worst. Average does not matter. Back in France, when I was a teacher, I remembered mostly students with the best and worst grades. Brilliant students did awesome things while others got all the problems you cannot imagine. If you translate this principle into races, the Disney marathon is a good example of a bad race: this is amazing how people are hooked by old marketing tricks (because at the end, they are just running on roads without any special perks!). But today kids, the race I am talking about today is the opposite, and if you are running the Groundhog Fall 50K, you will remember this moment for a long time. In a nutshell: this race is a little gem in the trail running community in Pennsylvania, it will give you a fantastic experience, the organization and support is like a first class event and the race director is one of the most friendly dude I met. I wanted to try a 50K. Just for fun. This was a fantasy for a long time and I was looking for a low-key event. After searching online, I found the Groundhog 50K race. Very affordable ($50 for 50K or $25 for 25K), close to Pittsburgh, it seemed to be the perfect match! My partner in crime wanted to join the party but not run a 50K, so, she signed up for the 25K. This is a trail run organized by trail runners for trail runners. Included with your registration, you do not get a big swag but an incredible number of perks, including pasta dinner, a wonderful supported race (including transportation to the starting line if you do the 25K) and post-race party (including pizza, beer and massage). Probably one of the best deal I ever had. On top of that, the Race Director (Bob Lott) proposed to host runners in need of accommodations. After sending an e-mail, he generously offered to stay at his house. I was surprised by such an offer: I did not even know this person and he proposed to stay at his place. Not only for me but for the two of us. So accommodating and friendly that I felt embarrassed, I did not expect to have such an offer (I was rather expecting to just get a place to put my tent in a yard, which would already have been a very generous offer!). But even if he was busy with the race, Bob took the time to discuss with us and know who we were. When you have such an experience, you no longer feel like a bib number but just a part of a community. The race is in Punxsutawney, PA. About 90 minutes (65 miles) from Pittsburgh so you can leave work early on Friday and make it to the pasta dinner. This is what I did and I was able to explore the area. The pasta dinner was basic but definitively friendly and organized by volunteers. 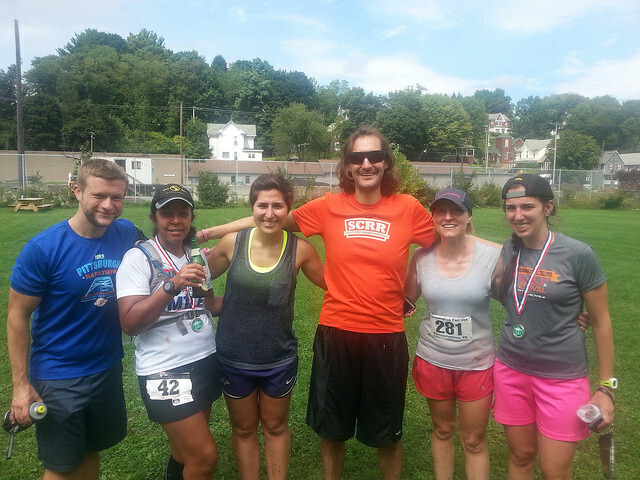 Afterwards, some fellow runners offered to party and have a beer at Rumors in downtown Punxsutawney.Not too long because we had to head back and get ready for the big day. In the meantime, my partner in crime changed her mind and decided to switch from the 25K to the 50K. This was not a problem at all and they just asked us to pay the difference ($25!). Nothing else. Again, the flexibility and the support of the organizers was just amazing: we were able to switch races during packet pick-up and there was even not a word about it or a discussion, we just need to ask! Simple and efficient! The race has also a lot of people from Team RWB. 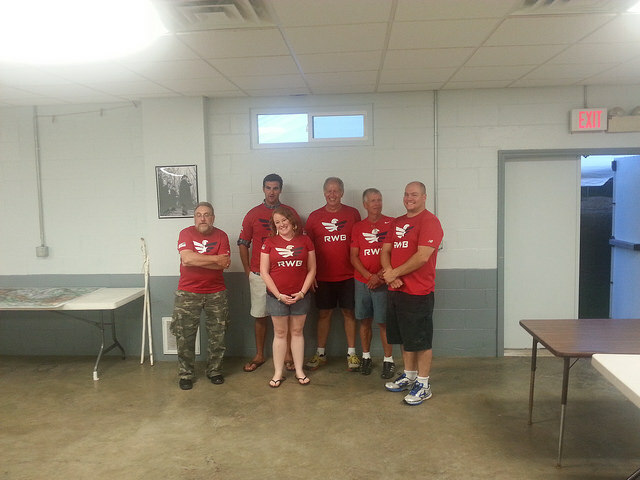 Being organized an a veteran, this is not a surprise that a lot of people from this team joined the race. I did not really know what it was about and, knowing that this race is now supported by this team convinced me to know more and eventually sign up. Getting back to the Race Director house for the night. We shared runners history, discussed about the race and eventually go to sleep before the big day. The race starts at 7am for the 50k and 930am for the 25k. There is a 8 hours cut-off, so, you need to complete the course (at least the 50K) before 3pm. In case you need more time, you can start early at 5am. The starting (and finish) line is next to the Community Center in Punxsutawney, PA. At the starting line, you have bathroom and coffee. A veteran gives the starts and you start running on a road that continues on the trails. The course goes through several hills, each one having a distinguished name. 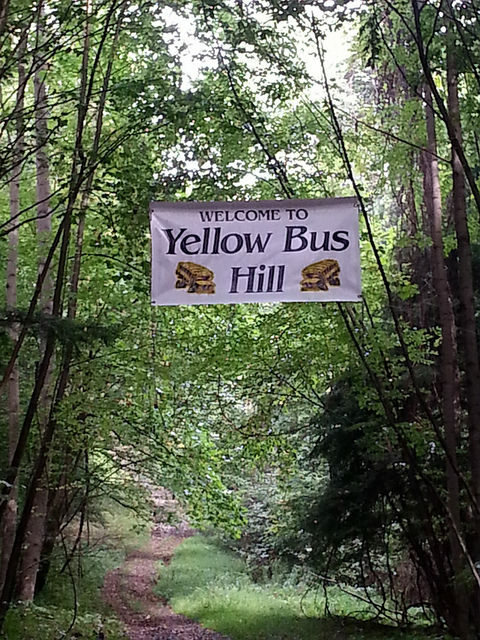 The name is shown by a sign (“Two beer hill”, “Yellow Bus”). You will have to take them in both ways as the course is mostly an out and back with two loops of some part of the race (you can see the mapmyrun workout for more details). Some hills are brutal and you should be very careful when running. The total elevation is 4000 feet, so, you have to be careful and, in case you never run steep hills, you will learn it the hard way. To give you an overview, the following video testifies that some ran into some issues when trying to run them. The course is pretty well marked. You might get lost if you take the early start at 5AM and miss one turn. In that case, this is important to come back and just find your way. Obviously, most of the trails are marked with white paint and this is very difficult to be lost when the sun is here. Also, the organizers mowed the trails so that if you have the choice between two paths, you just take the one that is clean. It was a big surprised to see how they took care of the runners and how clean it was, mowing all the grass on the steep hills is probably a challenge by itself. The aid stations are very well packed with soda (Mountain Dew, Pepsi), Gatorade, PB&J sandwich, M&M’s, Cookies, pretzel, etc. Way better than many other races. The volunteers is very friendly and supportive. When getting to an aid-station, somebody told me not to take a specific kind of cookie but take another one because they were “home made” and more tasty. This is probably not very useful for my race but just show how friendly and supportive they are! Once you are done, the finish line welcomes you with a great finisher award (a medal for the 25K and a Groundhog in glass for the 50K). The finish line is also packed with beer, soda, pizza, chips and other food items. In case you make a great time, you get a stone. 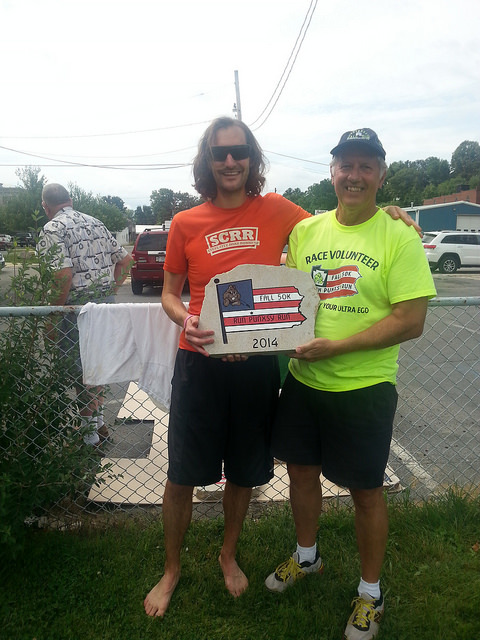 It seems that I was fast, so, I got my piece of stone and … most important: my picture with the Race Director, Bob! You like the trails, you are looking for a good race? First 50K or just a good training run, either long (50K) or short (25K)? This is the one you was looking for. Friendly, supportive, affordable, this race has everything you might expect and should be on your calendar. The next edition will have a new race director that is involved in team RWB (Bob, the one for the 2014 edition will be in the organization committee) and will be held in May. No matter what are your plans, you should definitively add this one on your list. This race showed me how the veterans community is friendly, active and can work together to make such a great event. Being in the USA with a European background, it also helped me to understand better what is behind veterans organizations and convinced me to learn more about Team RWB. Thanks again to all the organizers, the volunteers that made this day fantastic. Thanks to all my Steel City Road Runners friends that were part of this adventure and to my partner in crime for supporting me during this week end. I am really glad to be part of such a great community.